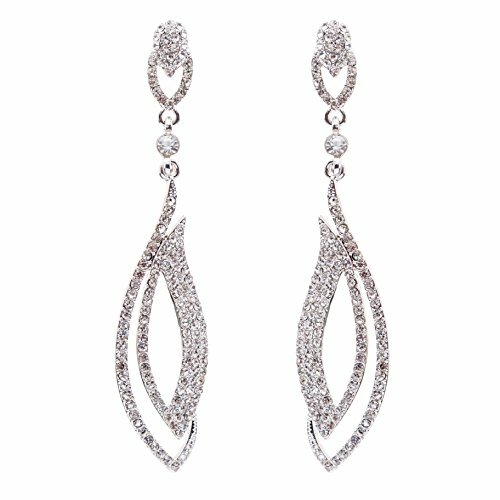 Add instant elegance to your gown or dress with these classy drop earrings. Each earring holds more than 30 crystal clear lustrous rhinestones. The posts are topped with a lovely inverted teardrop cluster and arc of stones. Dangling from that are delicate stones set in a leaf-like pattern. Rhodium plating covers the metal setting for this design. Rhodium is a brilliant precious metal that shines like a mirror. The earrings drop three and a half inches down from your ears. They will show brightly with any hair style - even long hair worn down. These would combine perfectly with one of our rhinestone necklaces or bracelets found on our site under the link for bridal jewelry. 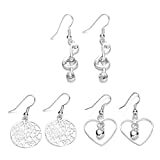 Won’t even compare Bridal Wedding Jewelry Crystal Rhinestone Classy Teardrop Dangle Drop Earrings with what is sold in other stores. This one is the best! 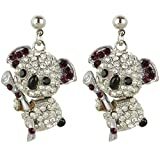 Where to find Bridal Wedding Jewelry Crystal Rhinestone Classy Teardrop Dangle Drop Earrings online? Nowhere else!